Hymn marathon collects donations for Christian Peacemaker Teams. Friday evening at 7 p.m., hymn singers will gather in Newcomer 19 to kick off a hymn marathon. The marathon will cover every verse of every hymn in “Hymnal: A Worship Book” and will likely last the entire weekend. 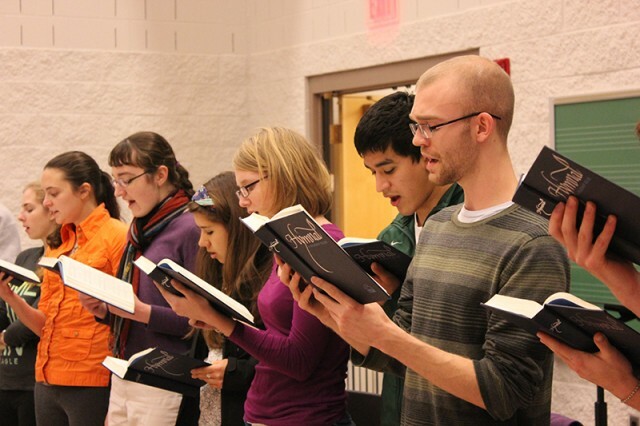 Hymns have long played an important role in the broader Mennonite culture and at Goshen College. While Switzer didn’t grow up in a Mennonite church singing hymns every Sunday, he discovered a strong affinity for singing hymns. This prompted him to form an official Hymn Club later in his first year along with several friends. The club has grown and taken on other projects over the years, such as Christmas caroling and organizing hymn sings at the annual Mennonite Relief Sale. The idea of a hymn marathon took shape around a table in the dining hall. Switzer was thankful for extra help in facilitating the planning effort. Hymn marathons are not unknown to Goshen College. The most recent was organized in 2003 by Deb Brubaker, professor of music, in response to America’s preparations for war in Iraq. This weekend’s hymn marathon also centers on peace. Goshen won’t be singing alone. Not only will congregations across the country host parallel hymn sings, groups in Scotland and Australia will also raise their voices. “I’m most looking forward to seeing students, faculty, staff and community members merge their voices with ours for peace. I’m also looking forward to the wider engagement,” Switzer said. For Switzer, using hymns, specifically, is important for this marathon. Everyone is welcome to participate in the marathon. Individuals and congregations can also host one-hour solidarity hymn sings or directly support Christian Peacemaker Teams through tax-deductible donations. For more information, contact Bobby Switzer at bkswitzer@goshen.edu.